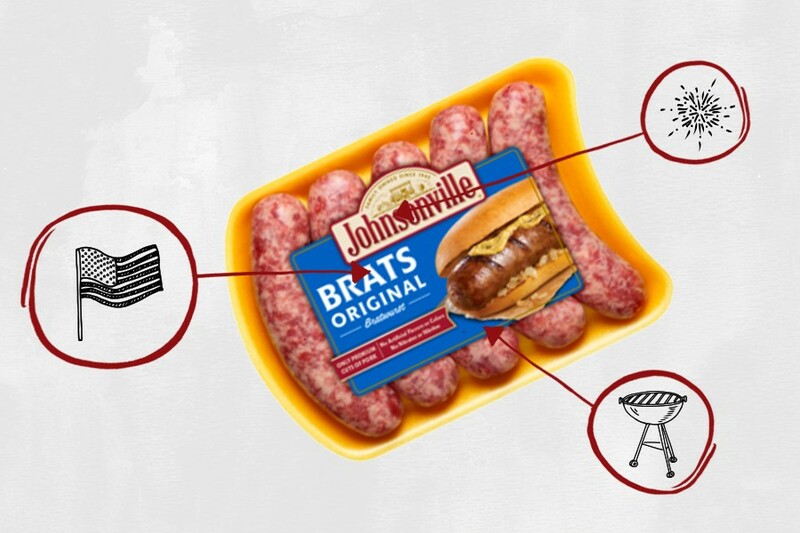 This edition: Johnsonville Original Brats, which are made from 10 separate ingredients that we’ve broken down in the exact order they appear on their website. That said, the U.S. Department of Agriculture defines bratwurst as “a fresh sausage product that may contain byproducts when properly declared in the ingredients statement.” This means that, if Johnsonville were to use animal byproducts (like organs) in their bratwursts, they would technically be required to list them on the ingredients statement, which they don’t. Whichever parts of the pig they do use, that mixture is then packed into a plant-based casing or a “natural casing,” aka the intestines of an animal. 2) Water: During the meat-grinding process performed to create the bratwurst filling, water is added to facilitate the mixing of ingredients. 3) Corn Syrup: Corn syrup is a liquid sweetener made of glucose. It doesn’t get as much negative publicity as high fructose corn syrup — which has been linked to obesity and diabetes by many, many studies (more on that here) — but regular corn syrup can also be debilitating, considering it’s basically liquid sugar. 4) Pork Broth with Natural Flavoring: Pork broth is made by simmering various parts of a pig (including the bones) in a mixture of spices (which account for the “natural flavoring”), and water. All in all, this is added for flavor. 5) Salt: This is also added for flavor. 6) Dextrose: Dextrose is a sugar derived from starches, like corn. Fun fact: Dextrose has a high glycemic index, meaning it quickly raises the blood sugar levels, so it’s used in IV solutions to treat low blood sugar and dehydration. People with diabetes might also consume dextrose tablets to raise their blood sugar levels if they become dangerously low. Because of this blood-sugar-boosting effect, consuming dextrose also provides an almost immediate jolt of energy — and then the inevitable crash. 7) Natural Flavors: Natural flavors are flavors derived from an actual food source — i.e., pork flavoring taken from an actual pig. 8) BHA: Butylated hydroxyanisole (aka BHA) is a common preservative added to prevent products from spoiling. “In lower levels — like those found in foods — some researchers consider BHA to be perfectly safe,” nutritionist David Friedman, author of Food Sanity: How to Eat in a World of Fads and Fiction, previously told us. “On the flip side, the National Toxicology Program has concluded that BHA ‘is reasonably anticipated to be a human carcinogen.’” Generally speaking, BHA is probably worth avoiding as best you can. 9) Propyl Gallate: Often used in conjunction with BHA and BHT (butylated hydroxytoluene), propyl gallate is another preservative. Animal studies found that it’s “slightly toxic” when ingested. 10) Citric Acid: Citric acid is a sour flavoring agent derived from citrus, and it’s often used to help products like bratwurst stay fresh while they’re sitting on the shelves. There are a few problematic ingredients found in these bratwursts — namely, corn syrup, butylated hydroxyanisole and propyl gallate. Will eating a few of these at your Fourth of July barbecue make you sick? Probably not. But chances are, you can find tastier bratwursts that aren’t stuffed with potentially damaging preservatives and sweeteners at your local butcher shop, so it may be worth the trip.